Welcome to the Phone Book Opt-Out Toolkit! Local government officials, environmental activists, teachers, and other community members will find this resource useful in spreading the word about how to opt out of phone book delivery. This page contains a variety of tools and information that you can use to launch your own phone book opt-out campaign. Learn more about the Product Stewardship Institute's (PSI's) phone book initiatives on the product page, or view the 2015 Yellow Pages Sustainability Report Card to learn about the role telephone directory publishers play in reducing phone book waste. 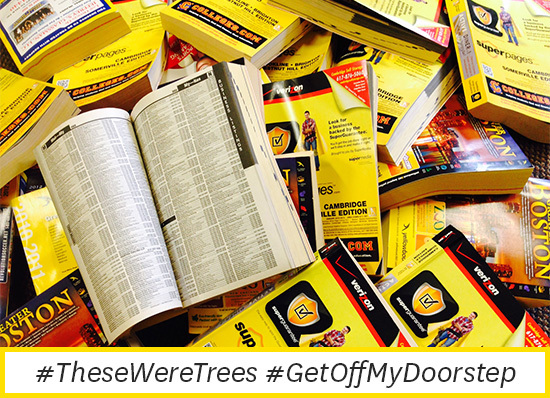 Why Launch a Phone Book Opt-Out Campaign? 4. Choose "opt out of all" option, then "save changes" and hit CONFIRM. We want your feedback! Take our 1-minute survey to let us know what you think about the effectiveness of the Yellow Pages Opt-Out website. Questions? Contact Megan Byers at megan@productstewardship.us or (617) 236-4866 to learn more.